Chameleon users: The below steps are for new CMS users. Learn how to switch to new calendar for Chameleon users. We are deprecating the classic calendar (AKA "old" or legacy calendar) and replacing it with a greatly improved, mobile responsive version. For those using the classic version, all your existing data automatically shows up on the “new” calendar, which we simply now call...the calendar. We are leaving both the old and new calendars on for now so that everyone has time to migrate to the new one. You’ll need to take several steps to transition from the old to the new. Hover over the navigation menu and click the Site Navigation overlay. In the list of menu tabs, find the Beta_Calendar tab and click its pencil. Change the Tab Label to Calendar or whatever label you want. Change the Minimum Admin Level dropdown to either Not Logged In (so the general public can see it) or Not an Admin (if you only want logged accounts to be able to see it). Set Show on site navigation? to YES. Click Copy Link so you can update any links to the classic calendar to point to the new. If desired, drag the tab with the to where you want it to appear among the other tabs. 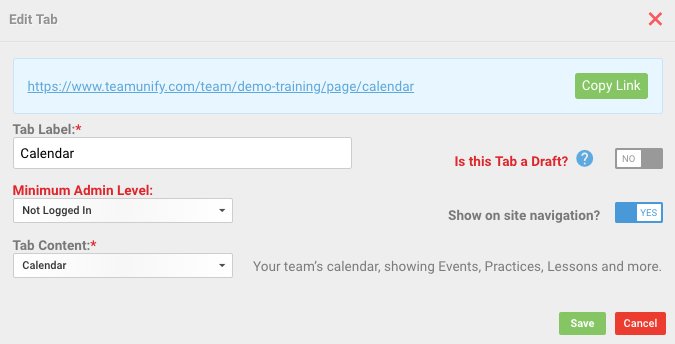 Find the Classic Calendar in the list of tabs (its title may be other than "Group Calendars" on your site). Click its to hide it. In the side menu click Events & Competition > General. Click the red Important Message button. Select the most applicable option and click Continue. 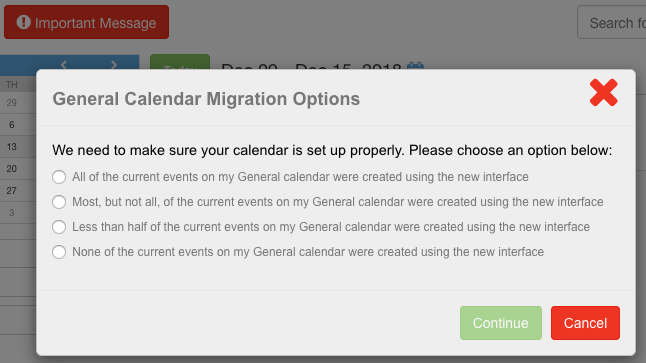 Update home page command buttons — If you use one of the command buttons on the home page for your Calendar page, change it to use the new calendar. Click the command button that links to the classic calendar. Under On Click Link to, click the page icon. Click Calendar in the list (or whatever you called it). In the top navigation menu, click a page that has a link to the classic calendar. Click the Custom Page overlay. Click the cursor on the link to the calendar and click the Link icon. Delete the existing URL and paste the URL you copied in the first set of steps (type Ctrl+V on Windows or Command+V on Mac, or right click in the field and select Paste). Repeat for any other pages with links to the calendar.